Now more than ever are men and women suspicious of authority, and for good reason. In this short century alone, the evil perpetrated by some in authority – in government, entertainment, business, and even the Church – has left many angry, afraid, and distrustful. As a result, even our language of “king,” “ruler,” “judge,” and “authority” have been tainted by so many sordid examples. Cardinal John Henry Newman’s The Dream of Gerontius enters into this conversation by reformulating our understanding of these concepts, so that by heavenly truths we may gain earthly wisdom. 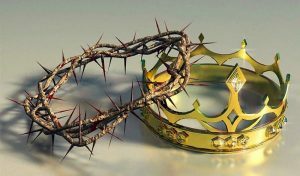 Here we see that our king’s glory is not in self-promotion or outward signs of power, but rather in sanctity and outward signs of sacrifice. While the kings, CEOs, and leaders of this world have been known for their remoteness, God is near; they demand service, but He offers Himself; they worship themselves, but He wears a crown of thorns; they build thrones, but He bears the cross, with all its pain and shame. This judge we will desire, for our eyes will be opened and we will see the reality of who we are and who He is, and it will not be fear of an unjust judge, but sorrow for hurting our beloved, that will fill our hearts. This season of Advent is an invitation to consider our coming judgment and to examine our souls. The Church calls us to a period of penance and works of charity, which are often the best forms of penance. But as we consider our judgment, we should ask ourselves: What type of king and judge is the One whom we call Lord and God? If we allow Him, He will come so near to us that our hearts will not be able to contain so humble and loving a Lord.